I love these pictures of my grandson. He is just so comfortable in his own skin and always looks so relaxed! The embellishments on this page are premade and that made it pretty simple. And of course.....I love Thickers. And these have glitter on them. WOO HOO!! I made this little banner as a design team project for The Crafty Scrapper. These are premade by Maya Road. I painted the lacy pennants with craft paint and then used some distress ink to age the paint a bit. I sanded also. Sanding and inking make a great combo for distressing. After that, adhering the papers and the little clothespins went quickly. Then I just added a few pretties and called it done! 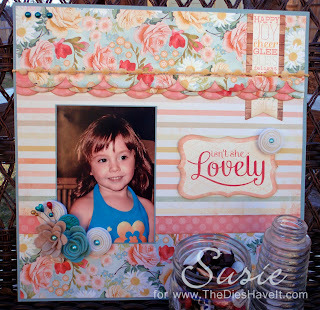 I wanted to share this layout with a picture of our beautiful granddaughter, Izzy. The base for this is made from three Maya Road house chipboard pieces, and using Maya Road trim. It was designed to be a mini book, but I never used it that way and decided to make this little holiday gem instead. 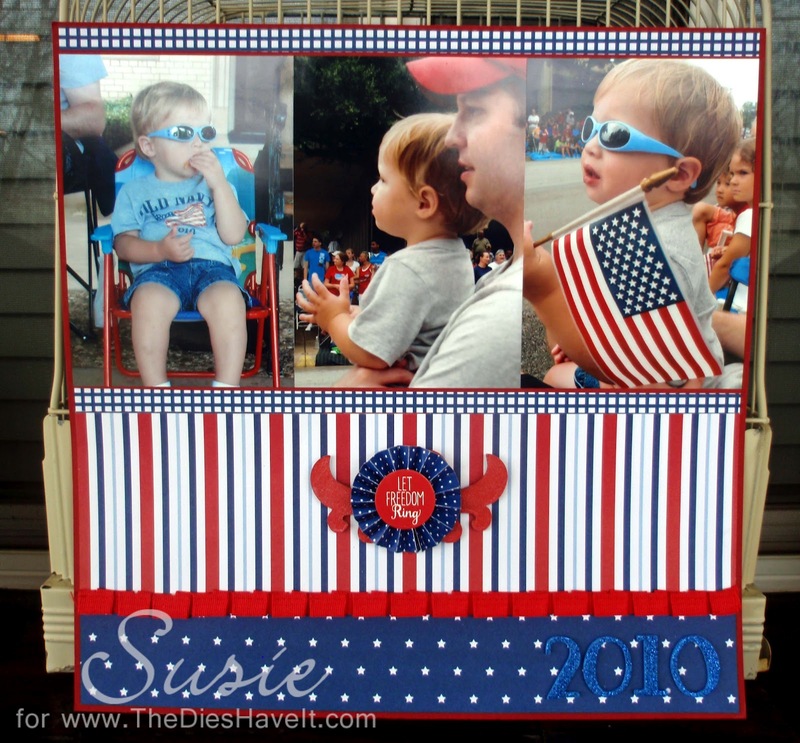 The pictures are from last year's July 4th parade. Our little Caleb and his friend Jillian were glad to pose! We arrived a day early so we could take a train into New York City since we both have never been there, I know hard to believe! Lisa has wanted to visit Tinsel Trading forever, that was our first visit. Not Time Square or The Empire State Building or Rockefeller Center but Tinsel Trading. We had the pleasure of meeting the owner and learning the history of her Grandfather and how he started the business. I was so amazed at the old vintage trim and the boxes of stuff everywhere, it was pure heaven! While there I opened a wholesale account and placed a order. I also purchased several things to bring back with me. Just wanted to share a quick layout with you that I did for The Crafty Scrapper. I liked the layout after I finished it, but there was a lot of staring and moaning right before I started to create! So did it stretch me? Yes...I think it did. And that is just fine with me. We all need a bit of stretching I think! Pebbles Fresh N Good line ( penny candy, local market) and Jillibean Soup neopolitan collection (bean bisque), and May Arts ribbon all from The Crafty Scrapper. Take Note layout designed by Jennifer. 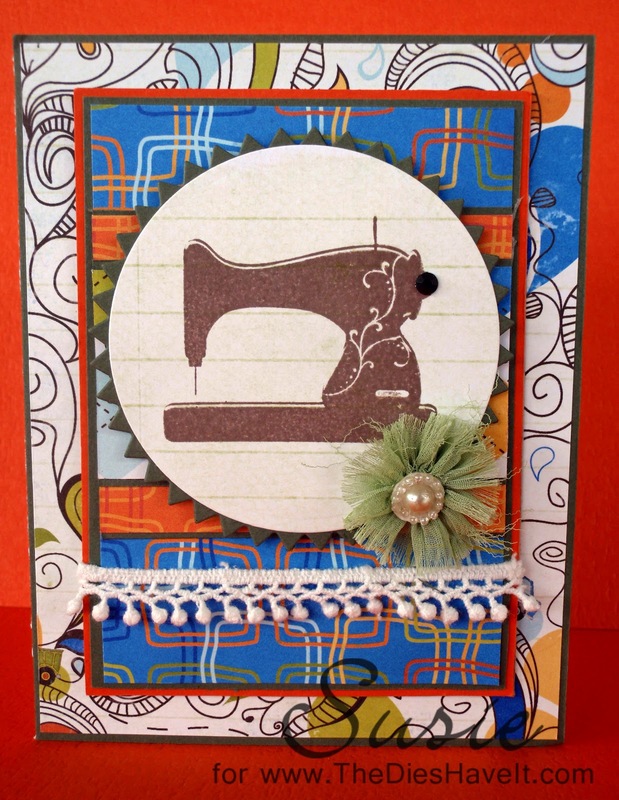 Here's a sweet layout and card by Design Team Member Jennifer using BoBunny's Country Garden Collection. 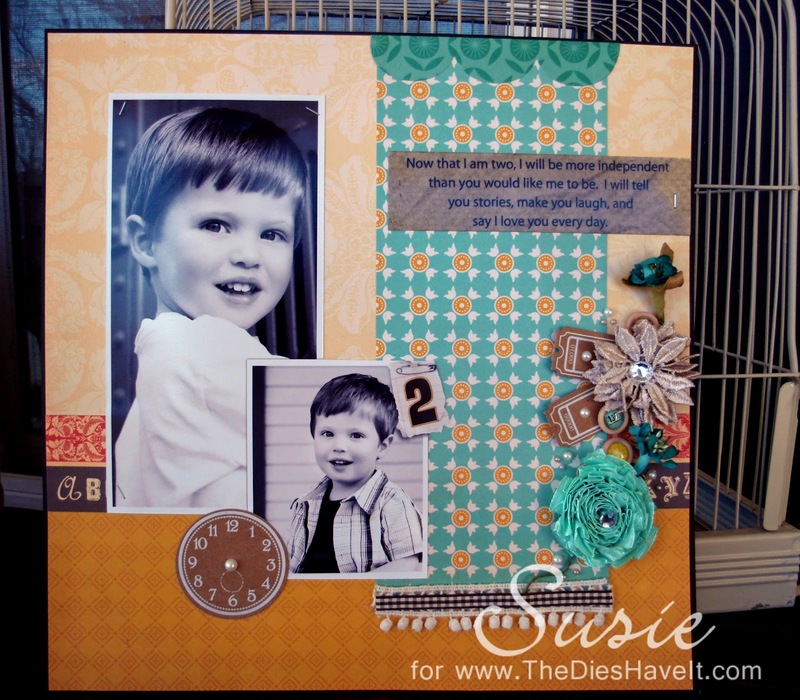 Here's a new layout by design team member Jennifer. 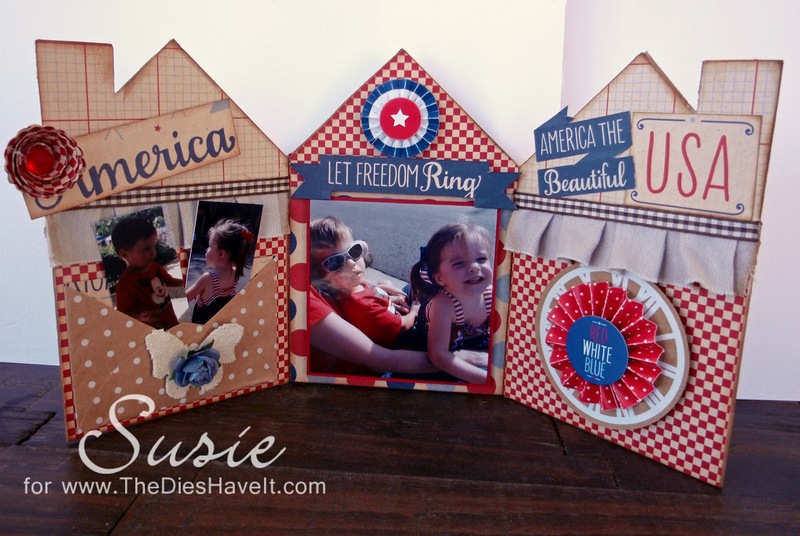 This sweet layout is by Design Team Member Jennifer. This sweet littl photo is my grandson Colby. He was about 6 weeks old when this photo was taken. I love the Authentique paper - Loyal & Faithful. I used my sewing machine to stitch around the green paper and then I inked the outside with Tim Holtz Distress Ink - Vintage Photo. I cut out various shapes of the paper and placed them around the photo. I also inked and distressed the edges. 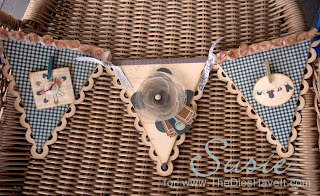 I had a little teddy bear chipboard which I painted with Chocolate Brown by Making Memories. I then added the little eyes, nose, and belly button. I was also given a little tag with a rocking horse which the quote is so cute!! I stamped the flowers 3 times and inked them and placed by the tag. I had in my stash the little butterfly wings by Tim Holtz. I painted them silver and added a flower my Maya Roads and added the stick pins and smaller flowers. I also had Tim Holtz hinge which I painted that and added pearls from my stash. I loved the little tickets as well. I printed off Colby and placed his name on one of the tickets and added little flowers. I used by Maya Roads the cloth buttefly and thread and added color to each. 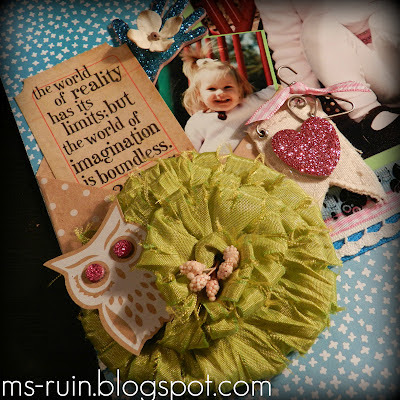 Thank you so much for looking and please visity The Crafty Scrapper for all of this wonderful materials that I used. This is a picture of my grandson Colby. I used BoBunny On The Go Papers - Trucks, Signs, and Roads. I used a punch by Martha Stewart around the blue paper and then inked it. I had this square doiley which I inked the outside of that as well. Please visit The Crafty Scrapper for all their wonderful products. Once Upon A Time - This post is by Design Team Member Ginger. I love this little photo of my grandson Logan. He is now 11 so it has been awhile. This paper is Authentique - Brave & Deserted paper from the Loyal Collection. I painted and inked the large flourish by Tim Holtz and if you notice I was given a zipper and I used it at the bottom of the page. I used the crochet flowers by Maya Roads and the others by Prima. 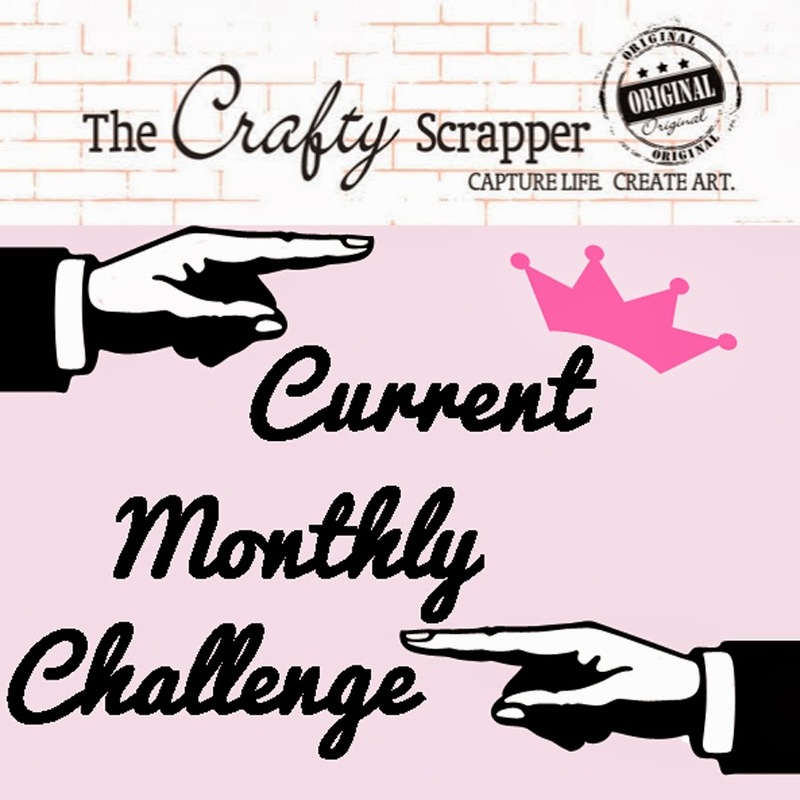 Please visit The Crafty Scrapper and thank you so much for looking! Have you been to Stolen Moments Inn? This retreat is for you if you have a group of six to eight friends who enjoy being together for the weekend. And the best part is that your group will have the retreat venue all to yourselves. 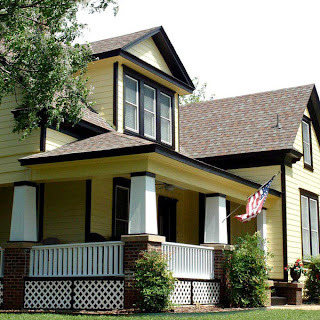 The house is a 1929 Victorian – fully furnished just for you. The owners have included all of the amenities a group needs to have a relaxing and fun scrapbook retreat. This retreat is close to The Crafty Scrapper – just about ten minutes away – in Maypearl, Texas. When you get to the house, there is a large parking area behind the house. There is a ramp where you can roll your supplies into the house on a cart, which is provided by the owners. The back door has a locking key pad which is reprogrammed for each retreat. The kitchen is fully stocked – you will just need to bring your food and snacks. The island in the kitchen provides ample room to set out a family style meal or ice cream/dessert bar. There is a separate living room if you want to get away and relax a bit. You can even watch DirecTV. The dining room is beautifully furnished with space for eight of you to enjoy your meals. The crop room has a flat screen TV/DVD combo and a movie library. The tables are six foot with a trash can at each station and a comfy rolling chair. The floor in the crop room is laminate, which makes it easy to move the chairs around. The lighting in this room is great whether day or night. There is a full bath downstairs which is ADA compliant. 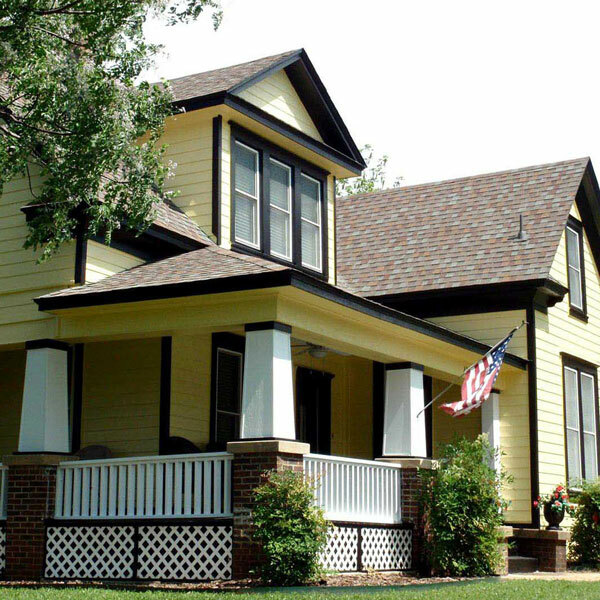 Upstairs there are two bedrooms and two full baths available. There are no bunk beds! The twin mattresses are comfortable and the linens are nice. Towels are provided with extra to spare. The bathrooms and bedrooms are very nicely decorated and roomy. One bathroom even has a jacuzzi tub if you want to soak and relax in a bubble bath. You just need to supply the bubble! Best of all, if there are scrappers up late, you cannot hear them while you are sleeping upstairs. If you are into drinking your coffee outside early in the morning, there is a deck out back with seating and the front porch also has seating. The front porch is a great place to take a picture of your group and guess what? There is a tripod upstairs to use just for this purpose. If you have forgotten anything during your stay, the grocery store is just down the street and there is also a Dollar General store. You can also order pizza and salad from the local pizzeria and it is good! The Crafty Scrapper is a short 10 minutes’ drive away. We provide discount coupons at the retreat for you. It’s the best of all worlds. You can retreat and shop your weekend away at Stolen Moments Inn and The Crafty Scrapper. And you know what? All of this can be yours for $125 per person per weekend. It is a great retreat bargain. Be sure to check out StolenMomentsInn.com to book your next retreat. II love the colorful strip of this BoBunny Collection of On The Go. It has all the little cards, dump trucks, airplanes which goes so well with a boy theme layout. I used Martha Stewart circle cutter and then I had an old punch I used on the circle which the little cut outs I just staggered throughout the layout. On one of the papers it had circles of trucks and airplanes so I cut them out and added to this page. I was also given a clock and cute little blue buttons which I placed inside the clock. There was a clear ribbon with the alphabet but I felt it needed to be seen better so I placed orange cardstock underneath it. When you have paper that is so bright and has cute little boy theme it does not need to much exrtras but only use what the paper offers. I really like this because the little photo is Colby playing with a little car. Thank you for looking and please visit The Crafty Scrapper for their wonderful products!! This layout features my very handsome five year old nephew, Anthony. He’s a looker, isn’t he? In this layout I used the following papers by Bo Bunny: Weekend Market Dot, Weekend Market Vintage Labels, and Weekend Market Stripe (shown below from left to right). 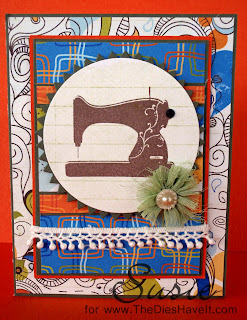 I used the Weekend Market Vintage Labels backside as the base –leaving it at 12x12. I then used Weekend Market Dot as an oversized mat. 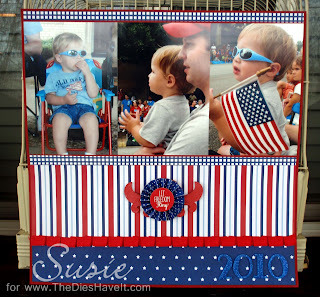 Since Anthony’s photo is an 8x10, I wanted a large mat, otherwise the picture would swallow the entire layout –a large mat diffuses attention from the size of the picture. I’m sort of an intricate cutter, you will see in my layouts that I cut a lot of paper in detail and use it to embellish. That’s exactly what I did with the Weekend Market Stripe Paper. I used the backside which had a beautiful edge on it with all sorts of delicate looking flowers and scroll work. I cut that portion out of the paper and used it as an edge on my layout. To give it some dimension, I used pop dots rather than just adhering it down flat. Here’s a close up of the embellishments. The great thing about Maya Road is that they have so much “tiny” stuff that you can cluster together and make beautiful little islands of loveliness on your projects. That’s what I did here. The piece of chipboard on the edge of the envelope was distressed using Broken China distress ink and then I stamped over it with a script stamp by Tim Holtz. 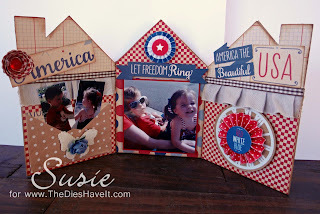 In this layout I used new paper by American Crafts –this set by Amy Tangerine. I know you’re wondering which ones so for your information, I used Gaby’s Gallery to mat the photo and Indigo Inspiration as the 12x12 base (paper shown below from left to right). Aren’t these super fun colors? Prima flower, and as for the number two, I took a piece of chipboard, covered it with Gaby’s Gallery and then wrapped this fuzzy string around it. I have to make at least ONE thing pop on my page so I pop dotted these clouds. 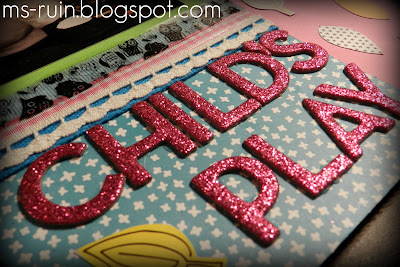 And finally I added this little die cut tag which is part of this new line. These flowers are from Doodlebug. Notice I also put lace trim on the edge of Bryn’s dress. I am an intricate cutter and there's lots of cutting involved in this layout. 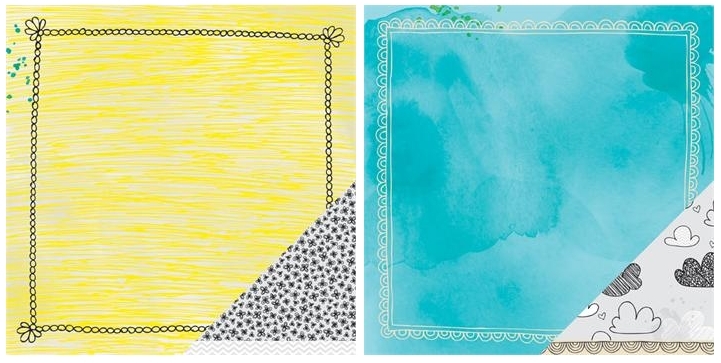 These papers are also by American Crafts from the Amy Tangerine line. The papers I used were Sienna Spirit as the 12x12 base and Paige's Portraits for embellishing...both shown below from left to right. I created my own frame around this 5x7 by cutting out the half circle/swirly designs from one side of Paige's Portraits. I then cut several frames out from Paige's Portraits and used them to embellish the page. I put pictures in or behind some of them. I also added these gorgeous glittery thickers by American Crafts. And I thought this cute little owl would look good in a frame too. Come and celebrate our 7th Birthday this weekend! We have a free make-n-take on Friday night at 7:00pm, awesome classes with Cheryl Mezzetti (there are still a few spots open) Saturday and Sunday, AND at check out you can get a scratch-off that will have 10-40% discount with one ticket being the GRAND prize! This sweet photo is my gd Paityn. I believe she looks like she is lost in a daydream. The paper is October Afternoon - Typing Pad, Steno Pad, and Coffee Bread paper. I stitched around the second sheet with a light golden thread. I then added a little circle doiley which I stained with Time Holtz Rusty Hinge and then added Vintage Photo Ink to the inside. I then took Maya Roads flourish and used the Rusty Hinge Stain on it and once it dried I used Glossy Accent on the top which gave it a very rich feeling. I also did the same to the cloth butterfly by Maya Roads. I had 2 off white lace which I glued both of them on and added a little orange ribbon to separate them. I used by Tim Holtz the clock die cut and Maya Roads little brown flower and stick pins. 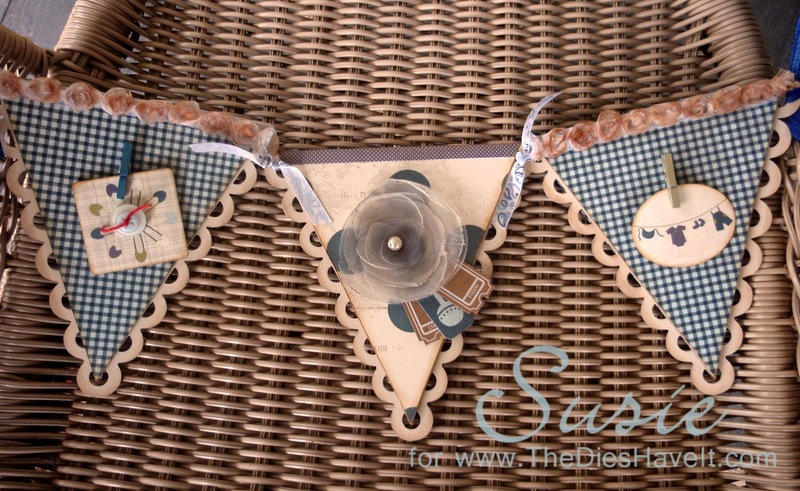 Thanks for taking a peek and please visity The Crafty Scrapper for all your wonderful products!! I love all of these different little elements together. Very youthful! These are Thickers by American Crafts. 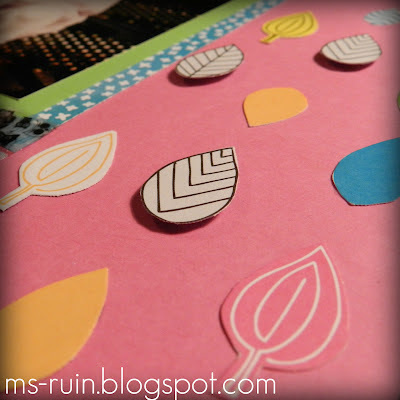 One side of the paper has all of these little leafy designs. 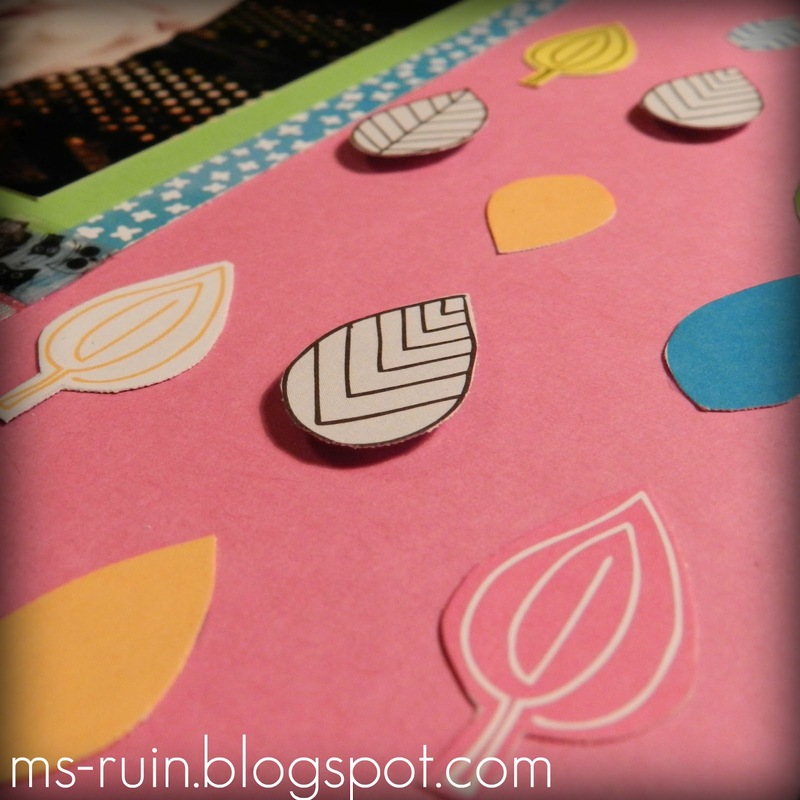 I cut them out and used them to embellish the paper and also pop-dotted all of the black and white ones. Gotta pop dot something! 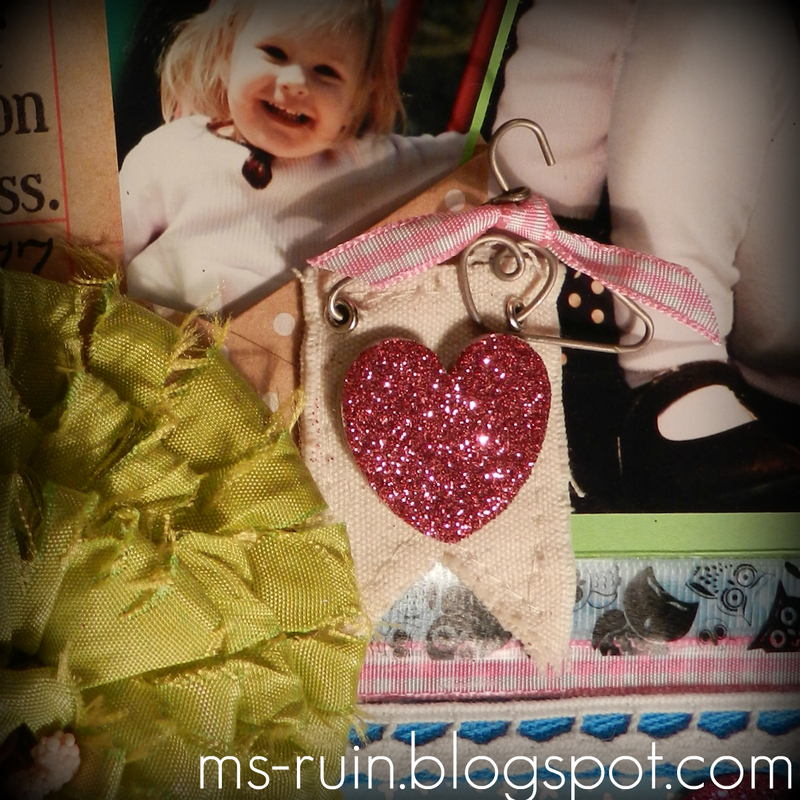 My favorite embellishment is the mini hanger and banner flag --both by Maya Road. I used my jewelry making tools to pry the hanger apart and then I ran the banner through and clasped the hanger back together. A must try!